An earnings beat drove the stock higher. But the long term picture isn't exactly clear. What: March was an especially kind month to 3D printing stocks. Stratasys' (NASDAQ:SSYS) stock gained 27.9%, while shares of 3D Systems (NYSE:DDD) ended 36.9% higher. Both moves were fueled by better than expected fourth-quarter earnings released during the month. So what: Stratasys' fourth-quarter revenue fell 20.2% year over year to $173.4 million, which translated to an adjusted earnings loss of $0.01 per share. These results compared favorably to Wall Street expectations, which called for Stratasys to generate $168.3 million in revenue and lose an adjusted $0.08 per share during the fourth-quarter. 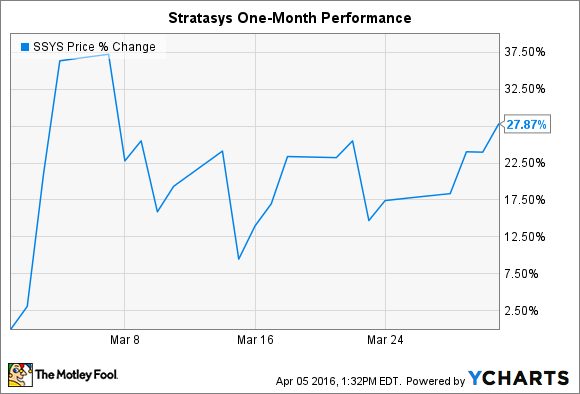 Despite beating expectations, Stratasys' earnings reflected continued weakness in the 3D printing sector. Throughout 2015, Stratasys and 3D Systems experienced a notable slowdown in customer spending that negatively affected their performance. Stratasys believes this slowdown was caused by customers purchasing more 3D printers than they needed in previous years, which essentially created an oversupply of 3D printing capacity in the marketplace and prompted a slowdown in demand. Overall, Stratasys' 3D printer sales fell 37% year over year. By comparison, 3D Systems' hardware sells fell 16.1% in the fourth quarter. This fall in hardware sales undermines Stratasys' razor-and-blade model as a long-term growth driver. Without strong 3D printer sales, the idea that Stratasys can drive long-term earnings growth through the recurring sale of high-margin consumables, loses some credibility. Now what: Stratasys believes that the uncertainty surrounding 3D printing demand is likely to continue this year. Management issued 2016 full-year revenue guidance that calls for sales to increase by 2.7% at the midpoint of the $700 million to $730 million range. The company is also in the process of restructuring its business to improve its operating performance and financial flexibility. In other words, there's a lot of uncertainty currently surrounding Stratasys' stock -- internally and externally. Until the demand picture improves and Stratasys' restructuring efforts show meaningful progress, investors should buckle up for more volatility.